Have you ever wondered how to find things in the NCBI databases? Maybe you tried to find something but didn't know how it was spelled. Or maybe you tried to use a common name like "pig" or "deer" to find information in a database, not knowing that all the organism names are in Latin. Or perhaps you're wondering just what kind of information is stored for different kinds of records and if you could search for this information. 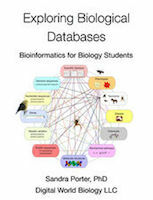 I wrote a book that covered this topic quite thoroughly, a couple of years ago, for the NCBI structure database. Now, I've decided to make some movies, too. This movie presents an introduction to using Entrez. It's 6.5 minutes long and it will show you how to look inside the NCBI databases and see the different kinds of information, that's stored in each one. Introduction to Entrez from Sandra Porter on Vimeo.